Insert a cross axle 3M into each end of the technic angular beam 4X4. Connect an angle element, 0 degrees onto each end of one of the cross axle 3M. Connect an angle element, 90 degrees to each end of the other cross axle 3M so that the unconnected end is away form the inside of the technic angular beam 4X4. Insert a connector peg w. friction into each angle element, 0 degrees so that the unconnected end is towards the inside of the technic angular beam 4X4. Insert a cross axle 3M into each angle element, 90 degrees. Insert the unconnected end of each cross axle 3M into the top axle holes of the PSP-Nx-v4. Insert the unconnected end of each connector peg w. friction into the center holes of the top back of the NXT brick. Connect PSP-Nx-v4 to sensor port 1 of the NXT brick using NXT cable. Make sure middle motor is connected to port A, right motor is connected to port B, and left motor is connected to port C.
Download EV3 environment program here. No LEGO sensors are used with either program and are not required for bot function. Make sure PSP-Nx block is downloaded and imported into your programming environment. Open PSP-Nx-v4Tribot.rbt with NXT-G and download it to the NXT. 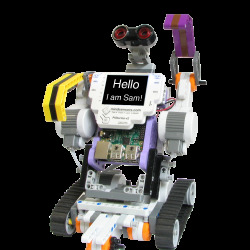 Or open PSP-Nx-v4Tribot.ev3 in the EV3 programming environment and download it to the NXT. Power on the PS2 controller. Sync the controller to the dongle. If analog light is not lit on the PS2 controller, press the analog button. Run the PSP-Nx-v4Tribot program on the NXT.